Arizona Mac V and Roy had been hanging out in their own nice roomy pens at Varian Arabians since we'd arrived after the clinic in Grass Valley. Arizona had developed a rather large white spot on his withers, telling me that I either needed a new saddle, or a change in my padding. Possibly he'll fill out more by next year. Nevertheless, I figured Arizona's riding was over for the summer. 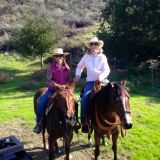 That was until Shelley (she's the one who gives supplements to and keeps an eagle eye on all the horses at Varian Arabians) suggested we go to the Biddle Ranch to celebrate her birthday. Never to turn down an offer like that, I whole-heartedly agreed. Roy and Arizona jumped into the trailer. Shelley and I wore grand smiles as we pulled out of the driveway. It was one of those idyllic days at the Biddle. Blue sky, little breeze, perfect temperature, little birds singing to us, fat cattle watching us mosey by as they laid in the sun, the hills and trees turning golden to tan. Arizona was his normal relaxed self as we rode up through the windmill pasture. As we got to Shady lane, I asked for a trot, then a lope. This was Arizona's first time loping out in the open. He was relaxed and stretched out into a nice easy stride. Roy followed along behind. We only went a few hundred yards, and then stopped so I could point out a few landmarks and tell some stories that go along with the location. We stopped at triple trough, where there were a handful of big cows standing by the water. They didn't move away at all, they just watched us suspiciously as the horses drank from their trough. 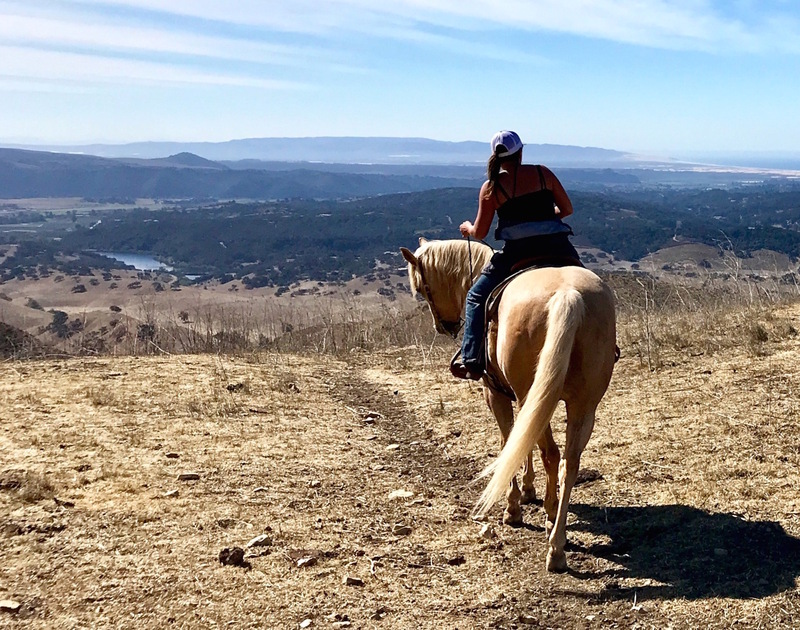 I thought about making it a short ride at that point, but it was such a glorious day that from the lookout point, where one can see all the way to the ocean and beyond, we turned left, and followed the contours of Suicide hill down to Bettencourt Lake. Now and then, Arizona would bounce and flounce and crowd up behind Roy, especially going downhill. I realized that quite possibly, my saddle may be uncomfortable going downhill, (hence that big white spot). At one of the steeper hills I got off, slipping in the soft dirt in my cowgirl boots, but leading him down the hill. He seemed much more comfortable without me on his back. At the bottom I got back on and he did fine. We ended the ride relaxed, happy, and content. It was a perfect last ride to finish a most enjoyable summer with this sweet little gelding. I petted his beautiful neck, buried my head in his mane, smelling that wonderful aroma, and thanked him (with a little tear in my eye) for being such a good boy. He'll never know how much I appreciate what he did for me this summer. Fernando pulled his shoes, trimmed his feet and handed me the lead rope. I think he knew where he was going next because he could barely contain his joy. He leapt, he danced, and whinnied as I led him through the ranch, down the road, across the street and into the pasture with the other 3 year old boys. I slipped the halter from him, thanked him one last time, and watched as he ran up the hill with two other colts. Back they came, tossing their pretty heads, tails in the air. A thought came to my mind… it is possible to be sad and happy at the same time. Sad to know that I would be 1,000 miles away for the next few months, but so happy to know he's having a grand time out there, just being a horse, with other horses, in the most bucolic setting. In the long run, it is the best thing for him. I remind myself that daily.